During the last decade and a half, some the United Kindom’s finest exports have been comedy-thriller films. Directors John Boorman (“The General”), Guy Ritchie (“Lock, Stock and Two Smoking Barrels”), Thaddeus O’Sullivan (“Ordinary Decent Criminal”) and Martin McDonagh (“In Bruges”) have made noteworthy contributions to the genre with trans-Atlantic success. 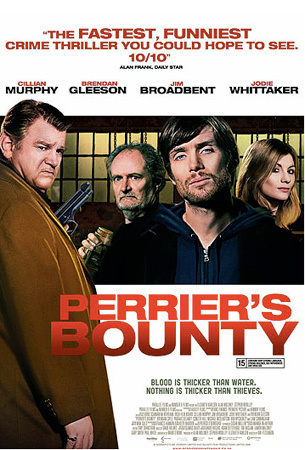 “Perrier’s Bounty” is director Ian Fitzgibbon‘s offering to the genre. And with the help of Brendan Gleeson (“Kingdom of Heaven”), Cillian Murphy (“Batman Begins”) and Jim Broadbent (“Hot Fuzz”), Fitzgibbon has a good chance of being added to the above list of filmmakers. If you’re in New York, consider checking this one out…if you’re into this sort of thing.